Come on, are you even surprised that I am covering another item? I love altering things here and there……aaah, I can’t help myself. And I saw a great idea HERE. But they used cork board and I just thought I’d cover my old mouse pad. Anyway, I just traced around the mouse pad onto the fusible web, cut it out, and then cut out the fabric about a 1/2 inch larger than the mouse pad. Then I ironed the fabric to the mouse pad with the fusible web. It was too simple. Then I cut the the corners of the mouse pad. Then I glued the extra 1/2 inch of fabric, to the under side of the mouse pad. Make sure to pull the corner pieces in tight to create a nice rounded edge. **Fabric glue would work great I’m sure, but all I had was Mod Podge. Yes, it is kind of messy but dries really well and clear (in case you’ve never used this magical stuff!!). So Ashley, I have made 4 of your craft ideas in the last 3 days (I put pictures on my blog)! I love it and am ready for more! I have determined that I’m not great at sewing though and there were multiple times I wished I still lived next door so I could run over and say, “Is this right?” I made the apron – easy, right…all straight lines. Sure…none of my lines are straight! Oh well. I sure enjoyed it! You have such great ideas so thanks for sharing. I’m so going to recover my mouse pad like this today! I love the fabric you’ve chosen, it has a great pattern. Thanks for sharing! Perfect! I was just thinking a few minutes ago how I wanted a new mouse pad because I have had mine for almost 10 years. *embarrassed* But this is so much better than buying one! Can’t wait to try it out. BTW, I found your blog a few days ago. I spent almost the whole day looking at it. I can’t wait to make everything!!! Hmmmm…..my old black mouse pad could use some updating. I’m forseeing my next project! Thanks! Where do you find all of your fantastic fabric!? I can’t ever find anything that cute! Caranna – If you look on the home page there is an FAQ button. Click it and there’s a better description there. Good luck!! I love it, especially the corners, nice work! I’ll be linking. Such a great idea, I love it! Everything is better cute! This is such a gorgeously simple idea! And what a way to spruce up a mouse pad. Well done! Brilliant!! I just found your blog and might I say that I am in love! Quick question…was your old pad foam? 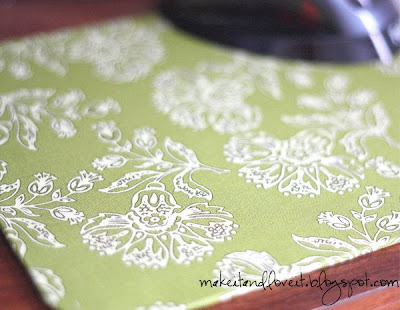 I am dying to do this to my old mouse pad. Right now, it’s advertising bluetooths. I love your tutorials! Cute, cute stuff. Just tried this and it turned out great! I used hot glue for the edges, and it was so easy and fast! thank you, i keep looking at my ugly ol mouse pad telling myself to make a cover…my ideas sewing a case like for a small envelope pillow but ill just do this… much easier. I love this idea, mine don't lay flat though. What might I be doing wrong? What setting is your iron on when you press it to the mouse pad? Hmmm…….I have the iron pretty hot but I don't leave it there for very long. Also, make sure the steam setting isn't on. Let's see……..and are you turning under the edges and putting mod podge underneath? And maybe when you are letting the modge dry, let it dry half way, and then lay something on top to put pressure as it finished drying. It could also be the type of mouse pads we are using. Maybe they're different. I hope that helps a bit. I made one following your tutorial and i love it much than before. Cute isn't a strong enough word for these. Finally tried this! I would've never thought of using fusible web! Thanks it worked great!! I just covered my mouse pad and it is adorable. The fusing was a fantastic idea. I used straight pens to hold the fabric tight while it dried. I love it. Thanks for the idea. I linked your tutorial in my blog – hopefully everyone will see how easy and cool your idea was! My mouse pad has never looked better! :-) Honestly I love it and the fabric is so cheerful. I linked to your site in my blog. Thanks for the idea! I use my laptop on top of a lapdesk. My mouse doesn’t like to work on the lapdesk, so I always need a mouse pad, paper or something there. I just tested, and a piece of fabric will do the trick. I am going to update my lapdesk and cover it with some pretty fabric. Now I won’t have to keep track of a mouse pad. Thanks so much for the idea. What an adorable idea! I’m wondering tho. 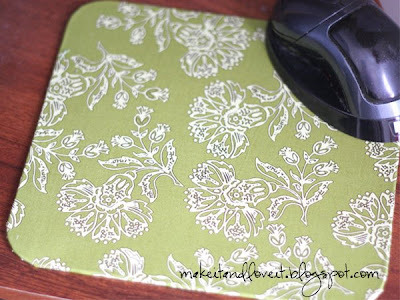 If you cover the entire mouse pad with Mod Podge will it make it easier to clean? I’ve not used Mod Podge much yet, so I wonder… once it dries, will it get tacky again if it gets wet/damp? About the mouse pad – why do you cover the sides? I works just great if it is just trimmed along the edge from your trace line or after it is attached. It can also be used as a hot pad.